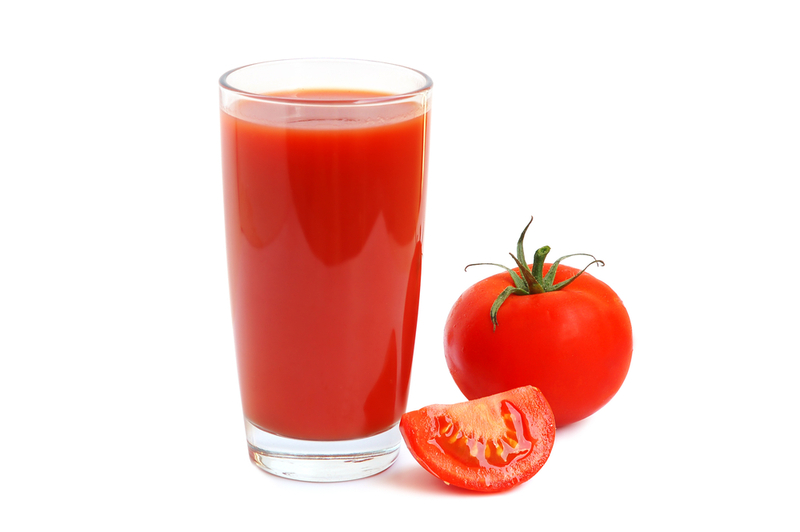 Tomato juice is a popular beverage with many nutritional and health benefits. While tomatoes are botanically a fruit, they’re treated as a culinary vegetable. Juicing vegetables is a good way to add more important foods to your diet. Tomato juice is a good source of copper, iron, magnesium, manganese, niacin, pantothenic acid, thiamin, and vitamin K. It’s also a great source of folate, potassium, vitamin A, vitamin, B6, and vitamin C.
One cup of tomato juice contains 8.6 grams of sugar. Be aware of this, as it can add up, but it’s not nearly as high in sugars as a fruit juice. Help prevent colds and illness by boosting your immune system. Tomato juice has some great immune boosting properties, namely vitamin a and c, iron, and folate. These vitamin and minerals help keep the body running at peak performance. They will help fight the effects of stress, reduce inflammation, and fight oxidative stress. In addition to the many vitamins and minerals found in this juice, it also includes an important pigment (carotenoid), lycopene, which has many healing benefits. This is the bright red pigment that gives a tomato its colour. It’s found most prominently in the skin of the tomato, so eating a whole tomato may have additional benefits. Lycopene is particularly beneficial for reducing pro-inflammatory compounds related to cancer. It’s also shown to significantly decrease inflammatory markers in overweight women (though these markers did not decrease in obese women). Here’s another study that found tomato juice to reduce inflammatory molecules. This is beneficial for reducing the risk of many diseases and damage throughout the body. Lycopene also reduces the risk of tumour growth in the breast, colon, liver, lung, and prostate. Furthermore, drinking tomato juice has also shown to suppress lymphocyte DNA damage caused by radiation. Tomato is part of the nightshade family, which means some people may have a lower tolerance to it. Tomatoes are also acid, so too much can cause acid reflux, and other gut problems. Most people can tolerate tomato juice in conservative amounts, but be careful not to overindulge. The biggest concern with tomato juice is the potential for high sodium levels. You can find low sodium options, which are far healthier than any “original” variety. A cup of original tomato juice contains roughly 27% of your daily sodium intake, while a reduced sodium option should be closer to 6%. Even better, make your own tomato juice. It’s best to avoid alcoholic tomato drinks, or at least know that it’s not going to be good for your overall health. Tomato Juice is one of my favorite juice. I really like to take Tomato Juice 3 to 4 times a week. This will help me to increase my body strength. Thanks for share this special article.